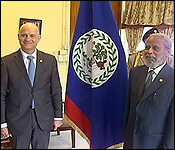 For the first time in almost two years, Belize has a Guatemalan Ambassador in country. He is Georges de la Roche Du Ronzet - and he presented his credentials to Governor General Sir Colville Young in Belmopan today. The former Ambassador, Manuel Roldan Barillas was recalled in April of 2016, when the BDF killed a 13 year old Guatemalan boy in the Cebada area of the Chiquibul Forest. There were reports that he would return in early March 2017, but he didn't, and the absence of an Ambassador has cast a shadow over neighborly relations. But, now there's a new Guatemalan Foreign Minister, Sandra Jovel and a new, internationally scrutinized push to complete the referendums in both countries. The appointment of an ambassador now, can be seen as an effort to normalize relations after the tensions of April, 2016. "It is my pleasure, it is my privilege to be able to present credentials to his Excellency on behalf of the government and people of Guatemala to bridge closer our government and people and friendships. It's an honor. Thank you." Ronzet is a US-trained, career diplomat, and a senior officer with the Guatemalan Ministry of Foreign Affairs with over 20 years' experience. 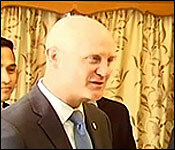 He has served as Ambassador to Canada, and India. He was most recently the Director General of International Bilateral Affairs, in charge of all the diplomatic relations and issues with all Guatemalan Embassies abroad and within Guatemala. He speaks fluent Spanish, English, French and basic Polish and Italian.